Not much of a post, I'm afraid. Just a bit of an up-date to where I'm at. 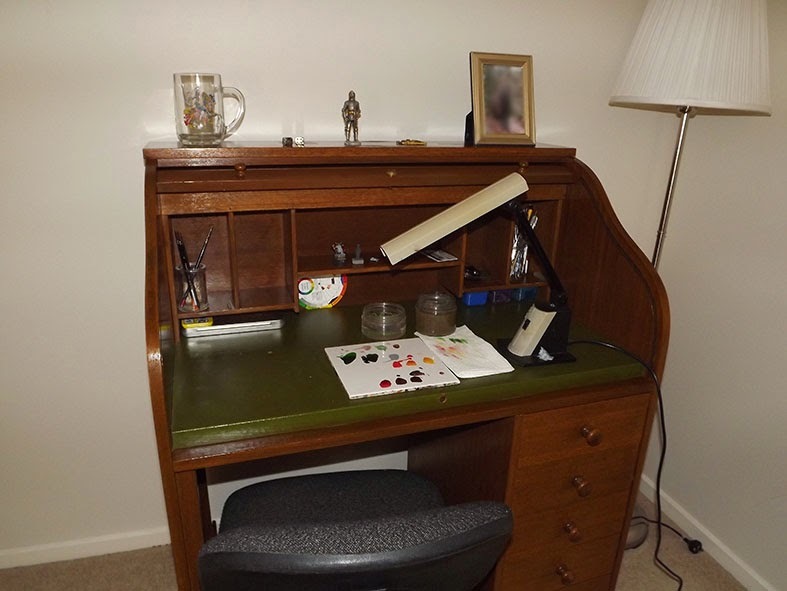 I was out early this morning to pick this old roll top desk up and sat down a did a little painting at it tonight. For the last year I've been relegated to hobbying in the the back room but with this new set up I'm back with the rest of the family. I hope that I won't feel as guilty spending all my nights toy-soldiering now. I hope. The last few weeks it's either been too hot or I've been too tired to get anything much done. Last week I started on the wonderful new Belegar Ironhammer and I should have him done by the end of this week. Pictures soon thereafter. It's nice to add such a great model to my old dwarf army. Not exactly sure what after that. I've some more terrain that needs to be done and I'm beginning to think about starting on a full sized army again. Oh, and there is the new Imperial Knight kit. WOW! Like I said: not much of a post. Sorry.